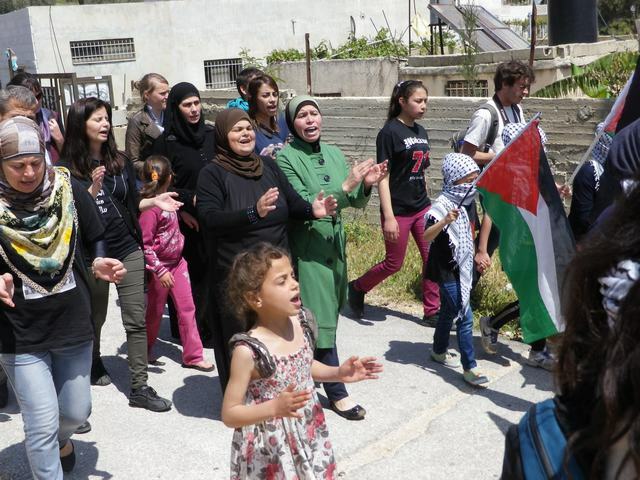 On Friday, April 26 2013, the residents of Nabi Saleh held a demonstration against the Israeli occupation. They were joined by Israeli and international solidarity activists, along with national and international media. Around 13:00, following the Friday prayer, the protesters met in the central square of the village and began the demonstration after a short speech. The protesters marched from the town center toward the main road that leads into the village. At the main junction, several Israeli military vehicles were present, along with the “skunk-truck” that is frequently used to shoot foul-smelling chemical water throughout the village. Protesters marched up a hill toward the land that leads to their water spring, Ein al-Qaws. Residents of Nabi Saleh have been forbidden to access the spring: settlers from the nearby illegal settlement of Halamish have confiscated it. As the demonstrators reached the top of the hill, Israeli soldiers approached and immediately began shooting tear gas. The crowd dispersed and some of the protesters went back to the village, seeking shelter from the gas in nearby houses. As 10 soldiers approached from the land near the spring, another 10 soldiers advanced along the main road. The soldiers assembled near the gas station and surrounding houses and continued shooting tear gas at the protesters for approximately one hour. At approximately 14:00 the demonstration ended. No arrests were made. Nabi Saleh is a village of 600 people, located in the Ramallah Governorate. Residents of Nabi Saleh began demonstrations against the Israeli occupation and the theft of their water spring in December 2009. The Friday demonstrations are met with violence from the Israeli forces each week, as soldiers and Border Police shoot “skunk water”, rubber-coated steel bullets, tear gas, sound bombs and live ammunition at non-violent protesters. Two men, Mustafa and Rushdi Tamimi, were murdered by Israeli forces while attending the demonstrations, in 2011 and 2012 respectively. Most recently, a Spanish solidarity activist was shot 3 times with plastic-coated steel bullets and was hospitalized.